Washington freshman Shawna Conger (23) puts up a shot over a North Adams defender during a non-league game at Washington High School Monday, Jan. 30, 2017. The Lady Lions made it a season-high four wins in a row with a 62-59 win at home over North Adams Monday night at Washington High School. The Lady Devils came into the game with a record of 14-3. Washington is now 9-9 overall on the season. Washington fell behind at the start, 8-0. 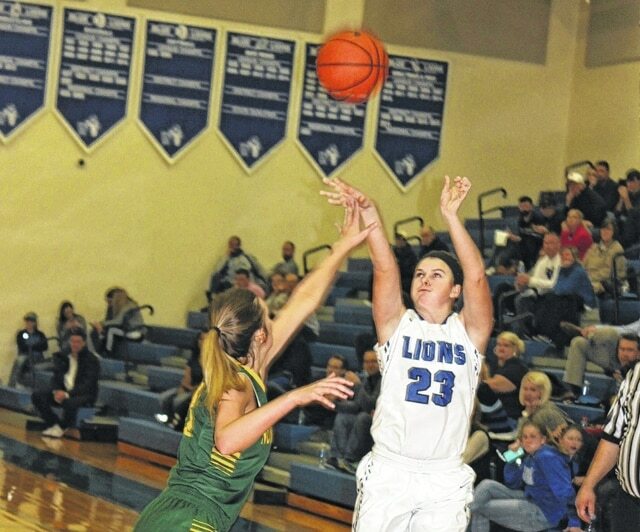 Early in the third quarter, the Lady Lions had cruised past North Adams for a 15-point lead, 35-20. In the fourth quarter, the lead changed hands five times as the visitors fought back. The Lady Lions took the lead for good with 2:31 to play. Washington sophomore Hannah Haithcock led the Lady Lions with 21 points. She went 8 of 8 from the free throw line and hit one three-point field goal. Haithcock led Washington with 13 rebounds for the coveted double-double. She also led the team with three blocked shots. Senior Savannah Wallace scored 11 points and freshman Rayana Burns and sophomore Bre Taylor both had seven points. Freshman Shawna Conger had five rebounds. Conger and sophomore Tabby Woods both had four assists. Woods, Burns and Haithcock each had three steals. Junior Avery Harper was the game’s leading scorer for North Adams with 31 points. She had in excess of 10 rebounds, according to head coach Rob Davis. Senior Madison Jenkins scored eight points and sophomore Grace McDowell had seven. The Lady Lions fell behind 8-0 after the first two minutes of play. By the end of the first quarter, Washington had fought back to tie the game, 9-9. Washington had its highest-scoring quarter of the game in the second, pouring in 22 points while holding North Adams to 11 to lead at the half, 31-20. North Adams battled back in the third quarter, but not before Washington increased its lead to 35-20. North Adams went on an 11-0 run to end the third quarter down by three, 42-39. North Adams caught Washington and took a one-point lead, 45-44 with 5:24 to play in the game. Woods scored, then Burns to give Washington a 48-45 lead. North Adams then scored four points to take a 49-48 lead with the game nearing the three-minute mark. Haithcock was scored and converted the old-fashioned three-point play to give the Lady Lions a 51-49 lead. Harper was fouled and scored, sinking the free throw to give North Adams a 52-51 lead with 2:38 left in the game. Haithcock then converted two free throws and Burns scored to make it 55-52, Washington with 1:39 to play. North Adams hit two free throws and Wallace answered with a pair of free throws to make it 57-54 with 1:10 remaining. Burns hit one free throw and North Adams responded with two to make it 58-56, Washington with 27.8 seconds to go. Haithcock hit four more free throws in the waning seconds and Madee Shipley hit a three for North Adams for what would be the 62-59 final score. Both teams shot their free throws very well. Washington made 13 of 14 for 93 percent. Haithcock was 8 of 8 from the line, including 7 of 7 in the fourth quarter. North Adams sank 14 of 18 shots from the foul line for 78 percent. Both teams hit three three-point field goals. Unofficially, Washington was 23 of 58 from the floor for 40 percent. North Adams (again, unofficially), was 21 of 52 field goal shooting, also for 40 percent. “North Adams is definitely a good ball club,” Washington head coach Samantha Leach said. “No. 34 (Harper) she was a presence inside. She was tough to handle. She got a lot of rebounds, I know, and finished at the basket really well. “They’re a good team,” Leach said. “They work hard. We had a lot of turnovers, especially in the first half. They put pressure on us and forced us to do some things we didn’t want to do. “Hannah really stepped up at the end of the game,” Leach said. “She was 8 for 8 from the foul line. “We lost our intensity for a little while,” North Adams head coach Rob Davis said. “We got an 8-point lead and we (became a bit lax). “We let things get a little out of hand there before the half,” Davis said. “There in the third quarter (when Washington got up by 15) it looked the girls didn’t want to be here. I talked to the girls and they made a great game of it. These are the kinds of games we’re going to be in come tournament time. Court House has a good team, they’re young. This is the kind of game you want to be in. You don’t want those 60-16 games. North Adams is off now until Saturday when they play Minford in the Ironton Classic. Washington returns to SCOL action Wednesday at home against Clinton-Massie at 5:30 p.m.
WASHINGTON — Rayana Burns 3-1-7; Maddy Garrison 0-0-0; Bre Taylor 2 9 (1)-0-7; Kassidy Hines 1-0-2; Savannah Wallace 4-3-11; Tabby Woods 3-0-6; Shawna Conger 1 (1)-0-5; Maddy Jenkins 1-1-3; Hannah Haithcock 5 (1)-8-21. TOTALS — 20 (3)-13-62. Free throw shooting: 13 of 14 for 93 percent. Three-point field goals: Taylor, Conger, Haithcock. Turnovers: Field goal shooting: 23 of 58 for 40 percent. Rebounds: 35 (15 offensive). Assists: 14. Turnovers: 18. Steals: 12. Blocks: 5. NORTH ADAMS — Brooklyn Wylie 0-0-0; Taylor Hesler 1 (1)-0-5; Maddie Toole 1-0-2; Charlee Louden 0-0-0; Lakyn Hupp 0-3-3; Brooklyn Stout 0-0-0; Madee Shipley 0 (1)-0-3; Caitlyn Young 0-0-0; Grace McDowell 1 (1)-2-7; Madison Jenkins 3-2-8; Brooklyn Young 0-0-0; Avery Harper 12-7-31. TOTALS — 18 (3)-14-59. Free throw shooting: 14 of 18 for 78 percent. Three-point field goals: Hesler, Shipley, McDowell. Field goal shooting: 21 of 52 for 40 percent. Turnovers: 18. In the j-v game Monday, Washington defeated North Adams, 39-22. Raven Haithcock was the game’s leading scorer for Washington with 12 points, including one three-point field goal. Halli Wall was in double figures with 10 points. She hit three three-point baskets. Savanna Davis scored six points and Bre Taylor had five, including one three-point field goal. Maddy Jenkins scored three (off a three-point field goal), Maddy scored two points and Sam Sever had one. Four players shared scoring honors for North Adams, as Abbi Stacy, Courtney Brown, Skyler Johnson and Alaina Eiterman each scored four points.